Adelaide has been named as one of a select number of cities worldwide to be recognised for its pioneering efforts in working towards a goal of ending street homelessness. The Adelaide CBD will join a select group of ‘vanguard cities’ on six continents to partner with the Institute of Global Homelessness (IGH) in setting ambitious but achievable goals to solve the problem of homelessness as part of the A Place to Call Home campaign. In announcing Adelaide as one of the ‘vanguard cities’, Dame Louise Casey, a driving force behind the establishment of the IGH, says South Australia’s efforts will help shape the global response to street homelessness. “It is significant recognition of Adelaide’s move to achieve functional zero homelessness in the CBD,” Dame Louise says. The Adelaide Zero Project was announced by the Don Dunstan Foundation in August this year, supported by the State Government, the City of Adelaide, Flinders and Adelaide universities, Bendigo Bank and a host of community organisations. “Homelessness is a global challenge but it is an eminently solvable problem – seven communities in the United States have already achieved a functional end to homelessness,” Casey says. The Institute of Global Homelessness is a partnership between DePaul University in Chicago, USA, and Depaul International, a London-based organization, which supports a global effort to support 150 cities to end street homelessness by 2030. “The vision of A Place to Call Home is that within a generation, we will live in a world where everyone has a place to call home – a home that offers security, safety, autonomy and opportunity,” Dame Louise says. In Adelaide, about 100 people are sleeping rough each night in the CBD. 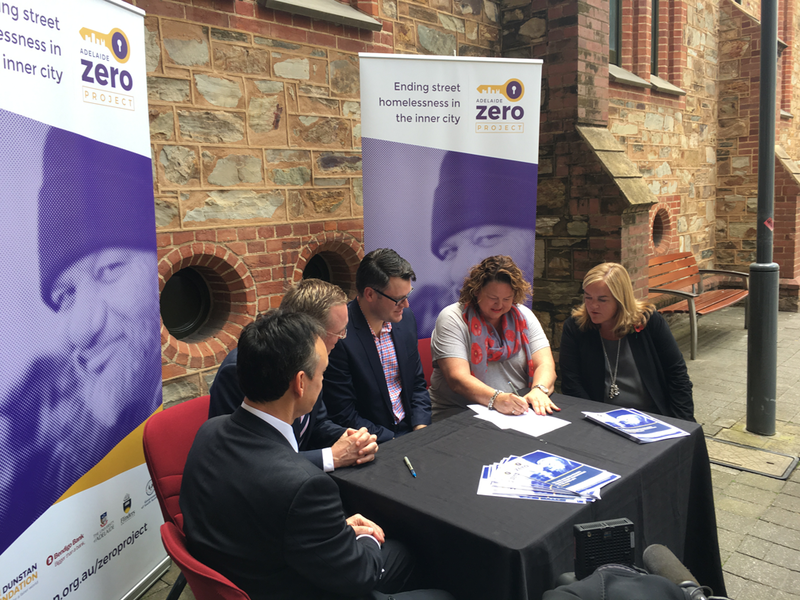 Pictured at the signing of the Memorandum of Understanding for the Zero Project are Joe Formichella, Bendigo Bank, Mayor Martin Haese, Adelaide City Council, David Pearson, Don Dunstan Foundation, Nat Cook, Parliamentary Secretary for Housing, and Dame Louise Casey Chair, Advisory Committee, Institute for Global Homelessness. Functional zero homelessness is reached when the number of people who are homeless in a city on any given night is no greater than the housing placement availability for that night. This focuses on the need for housing supply to match demand in the short term, and in the longer term. This entry was posted in Homelessness, News. Bookmark the permalink.